Ferroalloys are a group of materials which are alloys of iron that contain a high percentage of one or more non ferrous metals as alloying elements. These alloys are used for the addition of these other elements into liquid metal. They are normally used as addition agents. More than 85 % of ferroalloys produced are used primarily in the manufacture of steel. Ferroalloys are usually classified into two main categories namely (i) bulk ferroalloys and (ii) noble or special ferroalloys. Noble ferroalloys are of high value and consumed in low proportions. These ferroalloys are one of the vital inputs required for the production of special types of steels and are used as additive inputs especially in the production of alloy and special steels. 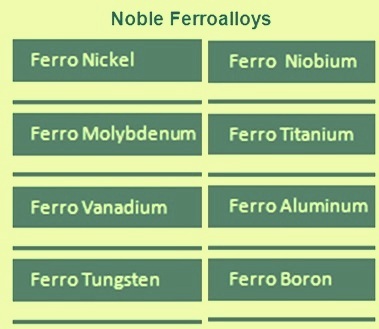 Noble ferroalloys (Fig 1) are ferro nickel (Fe-Ni), ferro molybdenum (Fe-Mo), ferro vanadium (Fe-V), ferro tungsten (Fe-W), ferro niobium (Fe-Nb), ferro titanium (Fe-Ti), ferro aluminum (Fe-Al), ferro boron (Fe-B). There are some noble ferroalloys which are having more than one non ferrous metal as alloying elements. Examples are ferro silico magnesium (Fe-Si-Mg), ferro silico zirconium (Fe-Si-Zr), ferro nickel magnesium (Fe-Ni-Mg) etc. Fe-Ni is used for alloying in the production of stainless and construction steels. Laterite ore is the main raw material for the production of Fe-Ni. Laterite ore is characterized by a relatively low nickel content and a high moisture content together with chemically bound water in the form of hydroxide. Typical laterite ore contains 1 % to 3 % Ni and a moisture content of 5 % to 10 %. Besides laterite ore, coke and/or coal is needed as a reducing agent, since Fe-Ni production takes place by a carbothermic process. Fe-Ni can also be produced from secondary raw materials, such as spent catalysts and sludge from the galvanizing industry. The production of Fe-Ni from primary raw material is carried out exclusively by the rotary kiln – electric furnace process. The first step of the process is a drying operation. Drying normally takes place in a directly fired rotary drier where the moisture content can be reduced. The next process step is homogenization where different ores are mixed with coal, coke and pelletized dust, usually recycled from the main process. The feed is then fed to a rotary kiln for the dehydration of the ore by calcination and for the pre reduction of the nickel and iron oxide. The process takes place at around 800 deg C to 1000 deg C. The calcining and pre reduction process produces furnace feed that contains the nickel as a metal and the pre reduced iron, mostly in the form of iron oxides. The hot pre reduced material is introduced directly to the smelting furnace where melting and final reduction occurs. Fe- Ni smelting takes place in open bath semi closed electric arc furnace with submerged electrodes. In the electric furnace, the reductive smelting operation occurs by the combined action of carbon electrodes and added solid carbonaceous reducing agent. The choice of the most suitable operation mode (open bath or closed bath) depends mainly on the oxides content of the slag (primarily FeO, SiO2, MgO, CaO) as well as the mass relation between slag and nickel metal. To reduce a high content of nickel oxides, normally the burden contains an excess proportion of carbon. This also increases the amount of iron that is reduced and also the final carbon content of the crude Fe-Ni. For the reduction of the iron and carbon content, a further refining step is necessary. The produced Fe-Ni needs further refining. Besides the reduction of iron and carbon, the impurities like sulphur, silicon and phosphorus are also to be removed. The refining can be carried out in any of the furnace such as a shaking reaction ladle, an induction furnace, an electric arc furnace or an oxygen converter. The purified Fe-Ni is cast into ingots or granulated under water. To avoid further refining, several process improvements have been made. In the ‘Ugine process’, no reducing agent is added. The electric furnace produces a molten ore, which is reduced to Fe-Ni by using ferro-silicon (Fe-Si) in a ladle furnace. In the ‘Falcondo process’, a shaft furnace is used instead of a rotary kiln. In the shaft furnace, a briquetted ore is reduced with a reducing gas. The subsequent electric furnace is then only used for melting the metal and separating it from the slag. Fe-Ni can also be produced from secondary raw materials such as residues that contain nickel. These residues, mostly spent catalysts from the grease production, are burnt in a rotary kiln in order to concentrate the Ni content as Ni oxide in the flue-dust. The off-gas is cleaned in a bag filter, where the collected dust is used as the raw material for the smelting process. The production of Fe-Ni then takes place in a submerged electric arc furnace (SAF). The molten ferroalloy is tapped and granulated in water. Fe-Mo is used in the production of different alloy steels. Commercial Fe-Mo contains between 60 % and 70 %. Fe- Mo is a molybdenum (Mo) based ferroalloy, produced by alumino/silico thermic reduction from technical grade molybdenum trioxide ( MoO3) or in induction / EAF furnaces from Mo containing scraps. Technical grade molybdenum trioxide (MoO3), also known as roasted molybdenum concentrate (RMC), is the main raw material in the production of Fe-Mo. Roasting carry out conversion of concentrated molybdenite (molybdenum sulphide ore) into technical grade molybdenum trioxide. Fe-Mo is produced either by the carbothermic or metallothermic (alumino/silico thermic) reduction of molybdenum oxides. Because of practical reasons like the smelting equipment used for the process and the reduced manufacturing costs, the metallothermic production of Fe-Mo is much more important than the carbothermic reduction. In the production of Fe-Mo, besides the main raw material, MoO3, iron oxide or mill scale, iron scrap, steel turnings are needed. Lime and fluorspar are commonly used as fluxing agents and charcoal, silicon (Fe-Si) and some aluminum, depending on the production route, are needed as a reducing agent. The metallothermic reduction is the most common process used for the production of Fe-Mo. Due to the higher Gibbs free energy of aluminum compared with silicon, Fe-Si is the preferred reducing agent in order to ensure safe process conditions. However, to obtain the required heat balance for the reaction, it is necessary to use a small amount of aluminum. The metallothermic process requires dry raw material for the process. Wet mill scale needs drying in order to prevent diffuse losses. Steel scrap is also to be sorted prior to being stored in a covered bunker. Smooth efficient smelting reactions require a blend of suitably sized raw material, this is of particular importance with respect to the oxides and the reducing agents. Fluorspar is sometimes added to improve the slag and metal separation. To get the right sized raw material, it is often necessary to grind and screen Fe-Si. The smelting operation can be done in a number of ways. The most common are given below. The metallothermic reaction is carried out in crucibles which are refractory lined steel cylinders. These crucibles are placed in long pits containing The reaction itself is carried out in different ways. The ‘top-fired reaction’ takes place when the whole charge is placed in the crucible and then ignited from the top. Alternatively, only a part of the charge is placed in the crucible and ignited, the remainder of the charge is then be added as the reaction proceeds. In another method the refractory lined crucibles are placed inside a chamber that can be enclosed. The reaction is then carried out by placing all of the charge in the crucible and igniting it, or by adding only a part of the charge, initiating the reaction and then progressively adding the rest of the charge as the reaction proceeds. Since the reaction is done by metals instead of carbon, the exothermic reaction does not generate CO or CO2. The smelting process produces a ferroalloy batch that weighs between 2.5 tons to 4 tons. After the slag is separated, the liquid ferroalloy batch is cooled either by natural air cooling or by quenching in water. The cooled ferroalloy batch is then broken and screened to produce the product of the desired size. Fe-V is vanadium based ferroalloy used for the modification of the microstructure of steel and for increasing the tensile strength, hardness and high temperature strength of steel. It is used in the high speed steels. Vanadium content in Fe-V ranges from 35 % to 80 %. Fe-V is produced by a carbothermic or a metallothermic (alumino thermic) reduction of vanadium oxides, assisted by the presence of iron. Since carbon is used in a carbothermic reduction, the carbon content of the ferroalloy is normally high. Hence the process cannot be used if there is a requirements for a low carbon content. low carbon Fe-V is usually produced by an alumino thermic reduction. The basic raw materials for the production of Fe-V are vanadium oxides (V2O3, V2O4, and V2O5) with lime, aluminum and iron or steel scrap used as additives. When necessary, grinding, sizing and drying of the materials are carried out prior to charging the mix to the smelting process. The alumino thermic reduction of vanadium oxide is a self sustaining process which is carried out in a refractory lined crucible. The reaction vessels used for this process are (i) refractory lined crucible using a non reusable lining, (ii) refractory lined ring placed onto a pit that contains sand, and (iii) electric furnace where additional energy can be supplied either for increasing the heat of reaction or for enabling slag refining operations to be carried out. The smelting operation consists of a batch process where the whole charge is transferred to the reaction vessel and ignited. After ignition, the combustion time for a batch size of about 1 ton of Fe-V is only a few minutes. Due to the short reaction time the content of vanadium oxides in the slag and the aluminum content in the metal may not reach equilibrium. The production in an electric furnace has therefore the advantage of keeping the charge in a molten state until the reaction gets completed. Depending upon the process type, the slag and ferroalloy are allowed to cool down in the crucible, or the slag and ferroalloy are tapped together in ladles or in beds to allow separation of slag and ferroalloy and to accelerate the cooling. The slag from the alumino thermic process can be used for further crucible linings or crushed and sized to be used as aggregate. The liquid ferroalloy is either air cooled or water cooled which facilitates further crushing. Fine grained materials of Fe-V are pulverized to powdery materials and are used in the production of welding electrodes. Fe-W is a tungsten based ferroalloy which is used for the production of special steels. Tungsten as an alloying element forms stable carbides and therefore increases the hot strength and wear resistance of steels. Such steels (high speed steels) are needed to produce high speed cutting tools that can be used up to temperatures of around 600 deg C. Tungsten also improves a number of other properties of the steel, such as the hardness, yield strength and the ultimate tensile strength. Fe-W is produced from different raw materials that contain tungsten oxides, e.g. wolframite, scheelite and hübnerite. The reduction of these minerals is done either by carbothermic or metallothermic reduction as well as by a combination of both. The carbothermic process that is known as the solid block melting process takes place in an electric arc furnace. Due to the high melting temperature of Fe-W, the produced ferroalloy cannot be tapped off from the furnace. After the smelting has been started, the ferroalloy accumulates in the bottom of the furnace. When the amount of the ferroalloy has reached the desired weight, the furnace is switched off. The ferroalloy ingot can then be recovered from the furnace after the refractory lining has been removed. The ferroalloy is then crushed and screened. If several furnaces are used in parallel, the production can then take place as a quasi continuous process. A combination of the carbothermic and metallothermic process using both carbon and Fe-Si as reducing agents is used to produce a ferroalloy with a high tungsten content. The process is carried out in three successive stages in an electric arc furnace. In the first stage, a tungsten trioxide slag is produced that is further reduced with Fe-Si in the following stage. The third and final stage is needed to increase the tungsten content by refining the low tungsten ferroalloy from the second stage by adding tungsten concentrates. The metallothermic process is less economical because the process requires very pure and therefore expensive raw material. In order to keep the process self sustaining, a mixture of silicon and aluminum is normally used as a reducing agent. The ferroalloy can be recovered from the furnace vessel after cooling and removing of the furnace linings. Metallothermic production of Fe-W is only economically viable if there are special requirements. Fe-Nb as an alloying agent improves the corrosion resistance and weldability of steel and prevents, especially, the inter crystalline corrosion of stainless chrome nickel steel. Fe-Nb contains niobium in the range of 60 % to 70 %. Fe-Nb is used as alloying additive in heat resistant and stainless steels to improve their corrosion resistance, plasticity and welding properties. Fe-Nb addition to construction steels prevents welded joint from corrosion. It is also used for micro alloying in high strength low alloy steels. It is used in specialty alloyed steels. Vacuum grade Fe-Nb is used for super alloys additions in turbine blade applications in jet engines and land-based turbines, inconel family of alloys, and super alloys for the aerospace industry. The raw materials needed to produce Fe-Nb are ores and concentrates that contain niobium and iron oxide. Niobium can be produced from pyrochlore ore, which also contains traces of polonium, which is a volatile, radioactive metal. The smelting of pyrochlore therefore requires enhanced safety and environmental procedures. From pyrochlore ore niobium penta oxide (Nb2O5) is produced. Nb2O5 is mixed with iron oxide and aluminum and is then reduced by alumino thermic reaction to produce Fe-Nb. The reaction normally takes place in a refractory lined crucible, where the complete charge is ignited or just a part of it that then serves as a starting mixture. Fe-Ti is produced in two grades containing titanium in the range of 35 % to 35 % and 65 % to 75 %. This alloy is used for production of construction and stainless steels, and welding electrodes. Fe-Ti when added to steel, increases yield strength of steel and reduces its cracking tendency. In the production of stainless steel with a high chrome and nickel content, Fe-Ti is used to bond the sulphur. Fe-Ti is manufactured from various raw materials such as titanium scrap, ilmenite sand, rutile and titanium sponge. It is produced either from primary or secondary raw materials. For the production of Fe-Ti, the primary raw materials are minerals that contain titanium oxide, such as ilmenite. The reduction is usually carried out by the metallothermic process since the carbothermic reduction produces a ferroalloy that contains too much carbon and hence not of much use in steel making. The production takes place as a batch process in a refractory lined crucible or in an electric furnace, depending on the process variation. In recent years, the availability of titanium scrap (lump scrap metal castings, wrought products and turnings from machining processes) in the market has increased and therefore the production of Fe-Ti from secondary raw materials has bacome more important. The production of Fe-Ti is achieved by melting ferrous scrap and titanium in an electric induction melting furnace. The alloying process is a slag free process. Furnace charges are calculated based on the analysis of the raw materials. The materials are weighed into pans and fed into an electric induction melting furnace. A chute system is used to feed in materials during the melting operation. When melting is complete, the molten ferroalloy is tapped into an ingot mould and a stream sample is taken for analysis. After cooling, the ingot is transferred to other operations such as breaking, crushing and grinding to achieve the required product size. Fe-B is mainly used as an additive in steelmaking to increase the hardenability, creep resistance and hot workability since steels alloyed with boron are oxidation resistant up to 900 deg C.
The raw materials needed to produce Fe-B are boric oxides and boric acid. Carbon (charcoal), aluminum or magnesium are used as a reducing agent. The alloys can be produced by carbothermic or metallothermic reduction processes. The carbothermic reduction takes place in single or three phase submerged electric arc furnaces depending on the process specification. Some variations of the carbothermic process exist. In one, boric oxides and iron oxides are reduced simultaneously with charcoal in a submerged electric arc furnace. In another process, boric acid, iron powder and charcoal are reacted in a Heroult-type electric arc furnace. The metallothermic process uses aluminum together with a small portion of magnesium as a reducing agent. This reaction is highly exothermic and needs only a few minutes to take place in a refractory lined crucible. The reaction can be ignited as a whole charge or as a starting mix. After the reaction is over, the ferroalloy that builds up in the bottom of the furnace is removed mechanically. It is then crushed and screened in order to produce the desired size of the ferroalloy. Fe-Al is a ferroalloy composed of iron and aluminum with the content of the aluminum ranging from 30 % to 75 %. It is primarily used as a deoxidation agent for steel, as well as for moulding in combination with scrap copper and carbon steel. Fe-Al as Ferro aluminum thermite (FAT) is an agent, that when ignited and mixed, can give off super extreme amounts of heat. Although this reactant is stable at room temperature, it will burn via an extremely intense exothermic reaction. The manufacturing of Fe-Al is carried out in the following three steps. The alumina is then subjected to a Hall electrolytic process together with cryolite to obtain aluminum that will then be combined with Iron to obtain the Fe-Al. Finally, after the solidification of the ferroalloy, milling and sieving processes are carried out, thus obtaining the suitable particle size for its addition in steel and cast iron. Fe-Al is produced in the form of powder, granules or pieces. Fe-Al is used for deoxidization, welding electrode manufacture and hard limited facing applications. In addition, Fe-Al is used in FAT that is used in turn to cut or to weld metal. FAT is made from 75 % iron oxide plus 25 % aluminum oxide. The iron oxide of FAT is not rust (Fe2O3) but iron scale (Fe3O4) oxide. The chemicals are thoroughly mixed together and then compressed into a suitable container. A first fire mix is then used to ignite the mixture. This reaction is used in welding applications, like the one used to join rail tracks in situ.